Radical Customer Service is a mindset. It’s a culture that was developed by Andy, President and CEO of The Receptionist, and one that the entire team supports and lives by every day. It also makes us think of the Teenage Mutant Ninja Turtles and start craving pizza, but I digress…join Michael Ashford, Director of Marketing at The Receptionist, and Sara, host of The Check-in as they talk about Radical Customer Service. 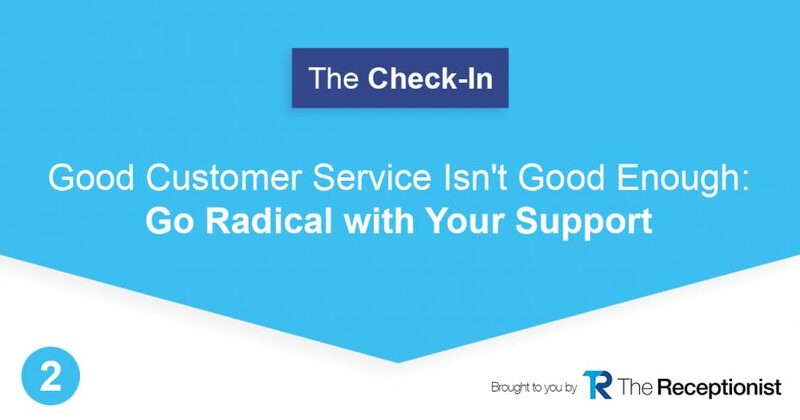 What the heck is Radical Customer Service? When it comes to the work that you do with your customers, providing them with the best service possible is something that is attainable when you work to practice radical customer support on an ongoing basis. Radical customer service goes beyond what is expected and aims to be exceptional- not simply to be exceptional, but to truly provide an amazing experience for those who come in contact with your business and services. Radical customer service is about your relationship with the clients, and is something that a whole company should embrace. Under the radical support model, your customer service isn’t simply a department in the company. Radical support goes beyond simply dealing with the mistake or issue and looks at who the person is that’s dealing with the issue. Our co-host, Sara shares about how she’s sometimes the angry customer (she also apologizes!) and how radical support makes her happy. Our CEO has gotten in on calls when needed and everyone here embraces the mentality that we’re all a part of customer service. Yes, there’s a dedicated department too, but customer service goes beyond those people. In today’s world, customers are used to automatic updates and notifications about the process of their customer service requests. Radical support means you’re following up during and after a customer service issue is occurring. Regardless of whether you’re interacting digitally or face-to-face with your customers, you can radically support them, no matter how they want to interact. By developing this culture within your company, you can become one that customers rave about and are loyal fans to. Isn’t that awesome, dude? (Say that last sentence like a Ninja Turtle! ).